India has had seven prime ministers in the last 25 years i.e. VP Singh, Chandrashekhar, PV Narsimha Rao, Atal Bihari Vajpayee, HD Devegowda, IK Gujral and Manmohan Singh since 1989. Of these seven PMs no one except Atal Bihari Vajpayee was the PM candidate before elections for the next ruling party/coalition. It means people had no clue about whom they were voting as Prime Minister when they voted for the ruling party in the respective Lok Sabha elections. The circumstances in which VP Singh became Prime Minister sowed the seeds of his dethronement within a year. After the 1989 Lok Sabha election, both Chandrashekhar and VP Singh wanted to become Prime Minister. Apparently a compromise was reached and they both agreed on Devilal’s name. In the Parliamentary Board meeting that was convened to elect the leader of the Janata Dal, VP Singh proposed the name of Devilal and it was seconded by Chandrashekhar. However Devilal proposed the name of VP Singh which was then accepted by the Parliamentary board. Chandrashekhar felt that this was a conspiracy hatched by VP Singh and he deserved to be the Prime Minister. This, despite the fact that VP Singh had become a bigger mass leader than Chandrashekhar, because of Bofors issue. VP Singh could not even complete one year of his term when Chandrashekhar split Janata Dal and became Prime Minister with outside support of the same Congress Party, against which he had won elections. All this probably could have been avoided if the Janata Dal had gone with a Prime Ministerial candidate in the elections and there would have been no confusion within the ranks of the party and common voters. After 1991 election results, when Congress emerged as single largest party and Rajiv Gandhi was assassinated, the party chose P V Narsimha Rao to become Prime Minister. Again, people of India had absolutely no say in who would become their Prime Minister. It was decided after the election results by the Congress Party. In 1995, BJP declared that Atal Bihari Vajpayee would be its Prime Ministerial candidate. This decision was actually taken unilaterally by Lal Krishna Advani without even discussing with top leaders of BJP. Even Atal Bihari Vajpayee was shocked to hear LK Advani’s announcement from stage in the party’s Mumbai adhiveshan. Till then it was widely believed inside and outside the party that if BJP ever comes to power, LK Advani would be the Prime Minister. LK Advani could take such a decision and announce it without discussing it with anyone as he was at the peak of his power within BJP. Since then no other leader, not even Vajpayee, has enjoyed so much power and confidence within the party. The announcement was a positive milestone in Indian democracy. Though the decision of nominating Atal Bihari as PM candidate was not a result of any democratic exercise and Vajpayee was probably not even among the top two most popular leaders within BJP, at least the voters had a clear idea who would be India’s Prime Minister if BJP comes to power. After the elections which were held less than a year after the announcement of Vajpayee’s PM candidature, BJP came into power for the first time, though only for thirteen days, and Atal Bihari Vajpayee was made the Prime Minister. After BJP could not prove its majority as no other party apart from Shiv Sena, Akali Dal and Samta Party supported it, H D Devegowda became Prime Minister with the outside support of Congress. Other leaders who were in fray after the elections to become Prime Minister were Lalu Prasad Yadav, Mulayam Yadav, Biju Patnaik etc. Again, H D Devegowda was not a Prime Ministerial candidate before the elections and he could become PM because there was least resistance to his name among top Third Front leaders and CPI (M) had committed the ‘historical blunder’ of not making Jyoti Basu as Prime Minister. H D Devegowda’s main opponent in Karnataka was Congress and he found nothing wrong in becoming Prime Minister with Congress support. Sitaram Kesari who became Congress president after PV Narsimha Rao withdrew support from the third front government led by HD Devegowda and made it clear that he would support third front only if they replace Devegowda with someone else. The third front meekly agreed and chose IK Gujral as their leader. The reason for Devegowda’s replacement is still a mystery today. Sitartam Kesari did not bother to give any strong valid reason for his withdrawal of support. After 1998 election Atal Bihari Vajpayee who was NDA’s PM candidate before the election, became Prime Minister. By now he had become the most popular leader in the country not only among BJP supporters but was also rated as top PM choice across all parties. In 2004, when UPA came into power Manmohan Singh was made Prime Minister just because he enjoyed confidence of Congress President. There was no discussion about his name even among top Congress leaders let alone UPA. Sonia Gandhi just decided on his name and the rest meekly accepted. Before 2009 elections, Sonia Gandhi announced that Manmohan would continue to be Prime Minister if the party comes back to power. 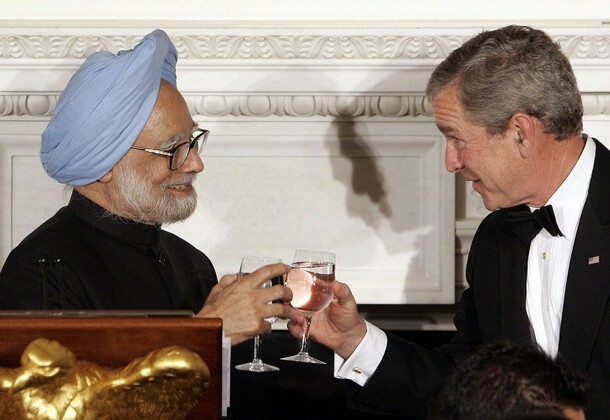 However there were also talks that there would be a smooth transition and Manmohan would be replaced by Rahul Gandhi. Circumstances other than popular public support have made six of India’s last seven Prime Ministers. In a mature democracy, people should know who all could become Prime Minister as a result of their votes. The argument that India is a Parliamentary democracy does not hold water any more. Britain too is a parliamentary democracy and India has adopted its West Minister model but in the last British general elections not only the three major parties announced their PM candidates but also had pre election debates among them. Narendra Modi has emerged as the most popular candidate for the post of Prime Minister in every Opinion Poll conducted in the last few months. He is not only the most popular BJP leader but the most popular leader across all political parties. This despite the fact that he has been a state Chief Minister since last ten years and has not held any national position within the party or the government since 2002. In 1996 when Atal Bihari Vajpayee was declared the BJP’s Prime Ministerial candidate, he was not even the most popular leader in the party (forget being the most popular leader across all parties). Lal Krishna Advani was the most popular leader at that time and one can argue that Murli Manohar Joshi was not less popular than Atal Bihari Vajpayee. It took three years, a disastrous performance by a third front government and most importantly projection by BJP as PM candidate for Vajpayee to become the most popular leader in the country. Narendra Modi has achieved almost the same level of popularity as Vajpayee had in 1998 & 1999 despite the fact that he has not yet been named as party’s official PM candidate. One can only imagine his support when he is officially declared so. If that happens, it would be another milestone for Indian democracy. For the first time, a national party would have to appoint someone its PM candidate who has risen from grass roots and is not a Delhi based leader, someone who has earned this position not because of circumstances but because Delhi based leaders had no choice but to adhere to popular public choice. It would be better than what BJP did in 1995 by declaring Vajpayee as PM candidate because this time BJP would be backing someone who is already the most popular choice in the country. If India’s next Prime Minister is someone who is the most popular leader in the country and does not owe his position to circumstances and palace intrigues, it would be a great leap forward for Indian Democracy. Muhammad Bin Tughlaq, ruler of Delhi from 1325 to 1351, is known for changing his capital to Daulatabad from Delhi just because he believed that capital should be at the center of the kingdom. He not only moved government offices to Daulatabad, which was at a distance of 700 kms from Delhi, but also forcibly moved the entire population. But due to inadequate water supply, the plan failed and the capital had to be shifted back again to Delhi. Myth 1 : Nuclear Energy will provide energy security. Nothing can be farther from truth. Over dependence on nuclear energy will actually lead to energy insecurity. We will have to import Uranium, technology and reactors from countries like US, Russia, France, Australia etc. We will be dependent on other countries for energy despite the fact that we have coal reserves which can last for more than 100 years. Myth 2 : Nuclear Energy is one of the cheapest options available. Again, a false propaganda. The report of the Working Group on Power, which was set up by the Govt to make a case in favour of nuclear energy places the cost at Rs 4 crore per megawatt for coal based projects; Rs 3 crore per megawatt for gas based projects; Rs 4.50 crore to Rs 5 crore per megawatt for run-of-the-river hydro projects; Rs 5.50 crore to Rs 6 crore for storage hydro projects. And for nuclear power projects? Rs 6.50 crore per megawatt. Turns out, nuclear energy is the costliest option !! Myth 3: Nuclear Energy is one of the cleanest source of energy. Actually, a minor accident can totally clean the surroundings of a nuclear reactor (pun intended). Chernobyl accident is a perfect example. Besides Nuclear Wastes will remain a constant threat to environment. Nuclear Energy is anything but clean. In US alone there have been 51 Nuclear outages in the last 41 years. In future, Nuclear Energy is expected to increase Greenhouse Gas Emissions, as high grade Uranium is getting depleted. Even the current nuclear reactors in India and several other parts of world are vulnerable to deterioration of feeder pipes. If sovereignty means independence in taking our own decision then by signing the deal in its current from, we would be severely compromising with it. Once the deal is signed, we would not be free to do any nuclear test under any circumstances if we want fuel supplies for the nuclear reactor to be unhindered. Despite the fact that there are enough provisions in the 123 agreement and Hyde act which allow US to stop all supplies in the event of a nuclear test by India, the Government wants us to believe that US would not exercise this option for the sake of Indo-US relations!!! Now this fairy tale would have been believable only if in 1978 US had not stopped fuel supplies to Tarapur Nuclear Reactor despite the fact that India had not violated the 123 agreement signed in 1963 !!! US wanted India to sign NPT and hence they changed their domestic law in 1978 which superseded the agreement signed with India in 1963. The 123 agreement signed in 1963 was better for India than the current 123 agreement but still that could not stop US from halting fuel supplies in 1978. This time if they want to stop fuel supplies, they wouldn’t have to amend any law as there are enough provisions in Hyde Act and 123 agreement to do so but still the Govt feels we need not worry as US will not do something like this with India. This blind infatuation is reminiscent of Nehru’s policy towards China which was guided more by emotions than realpolitik. Looks like after the debacle of Nehru’s Hindi Chini Bhai Bhai in 1962, its time to sing Hindi Yankee Bhai Bhai !!! Myth 5: If the deal is not signed in George Bush’s tenure, it would not be signed at all. Hillary Clinton, Barrack Obama and John Mc Cain, the front runners in the US Presidential elections have expressed their support to the Nuclear Deal. They have a different opinion on every other issue like Healthcare, Iraq War, Foreign Relations, Outsourcing etc but on the Nuclear deal there is a rare unanimity. There is no reason to believe that a new US President would not support the deal. Any US President would love this deal in which US has nothing to loose and the deal will actually benefit the nuclear industry in US. Even the US Senate had passed the deal with a big majority of 85-12 with huge support from both the Republicans and Democrats. There is no reason to believe that this huge support for the deal in the US Parliament is going to change. If at all the deal is facing any serious opposition, it is from the opposition parties in India. Actually, the deal is in serious trouble if it is not passed in the tenure of the current Indian Govt. and there is a change of guard in the central Govt. as the opposition parties have left no doubt that they are against the deal. US, which is so keen to help India in attaining energy security through Nuclear energy, has not produced a single nuclear reactor in last 30 years !! Now if Nuclear energy is so good why has the US not increased the production of Nuclear Energy despite rising oil prices and a growing energy crisis ? Australia, which has 24% of total Uranium reserves of the world, does not have a single Nuclear reactor !! It exports all its uranium to countries producing nuclear energy. Now Australia is not some African country which is being exploited for its Uranium reserves. It is a developed country which will not face the problem of raw material once it decides to make nuclear energy. But still it has no plans yet to do so and recent news suggest it is very keen to sell Uranium to India, once the deal with US goes through and of course we are supposed to be happy and grateful to US and Australia for doing us this favour !! Why is there a strong approval for the deal in the Indian Middle Class? Manmohan Singh has compromised on several issues since he has been the Prime Minister of India, for the sake of stability of his Government. It is an open secret that on issues like Reservation, FDI in Retail & Insurance and on many other policies he had to bend under pressure from his allies. The reformist Finance Minister of 1991 has not initiated any new financial reform after he became Prime Minister because of the lack of support from his political master and stiff opposition from his allies. But the only time when we have heard him speaking his mind is on the Nuclear Deal. He once even dared CPI-M to withdraw support on this issue. This I believe is the main reason why there is a general approval for the Nuclear Deal in the Indian Middle Class. When we see that our PM who has been altering his policies under pressure has taken a firm stand on Nuclear Deal, we feel that the deal should be really very good to India or else why would the PM risk the survival of his Govt? And this is not just the reasoning of common people. Even Barkha Dutt and Vir Sanghvi have accepted that they are not aware of the details of the detail but have full faith in our PM and hence they support the Nuclear Deal. Now it is one thing for common people to believe their leaders blindly but isn’t the fourth estate supposed to be objective ? And this lack of objectivity in the coverage of nuclear deal by the media has given a totally wrong picture to the Indian masses. We are also told that this deal is very important for Indo-US relations and if the deal fails, our relations will spoil. Never before in the history of an independent country, a deal was made a cornerstone of bilateral relations. I believe we need to have some confidence in us to believe that we need not be subjugated to such a biased agreement just for “betterment” of ties with a country. It does not really speak well for a rising superpower like India. Let us not outsource our objectivity to Media and believe something blindly. It is not very difficult to analyze the facts about Nuclear Energy and Nuclear Deal to find the truth. The decission that India takes now will have a huge impact on its Energy Security, Environment, National Security and Sovereignity and any wrong move will not only affect the current generation but our future generations as well.